I was super sad that I couldn't go to BEA this year because of work, but I was excited to see that BookCon was going to be 2 days this year. All day Saturday and all day Sunday? I could do that! I hopped the first flight out Saturday morning and made it to the Javits Center in New York City around 11:30 a.m., about an hour and a half after the Con began. I went to the exhibit hall first, where the publishers started strong -- books, t-shirts, and all types of swag were being handed out! There were a LOT of people at BookCon and the lines were crazy long, but everyone was really nice. One of my favorite parts about book conventions is actually meeting new people in line. It's just so much fun to talk about your favorite books and book characters with people you GET YOU, you know?! 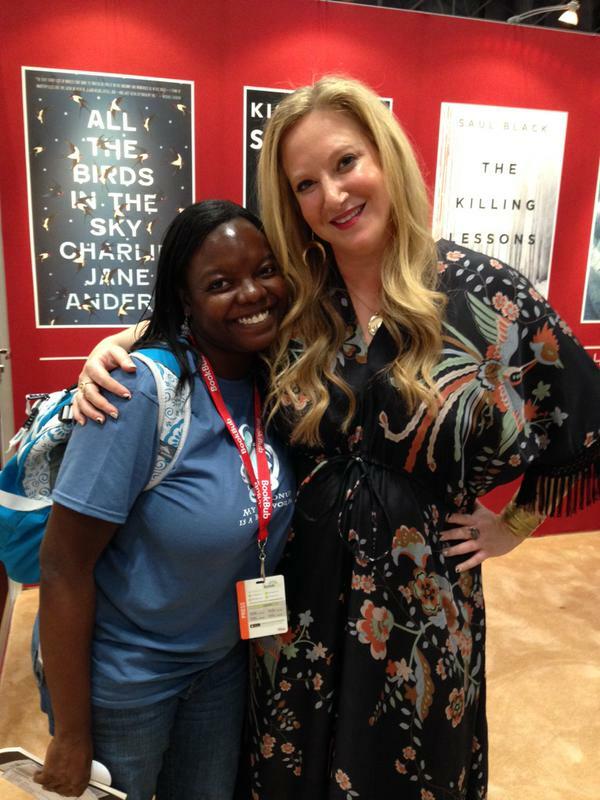 Me with Leigh Bardugo. Cutest picture ever. 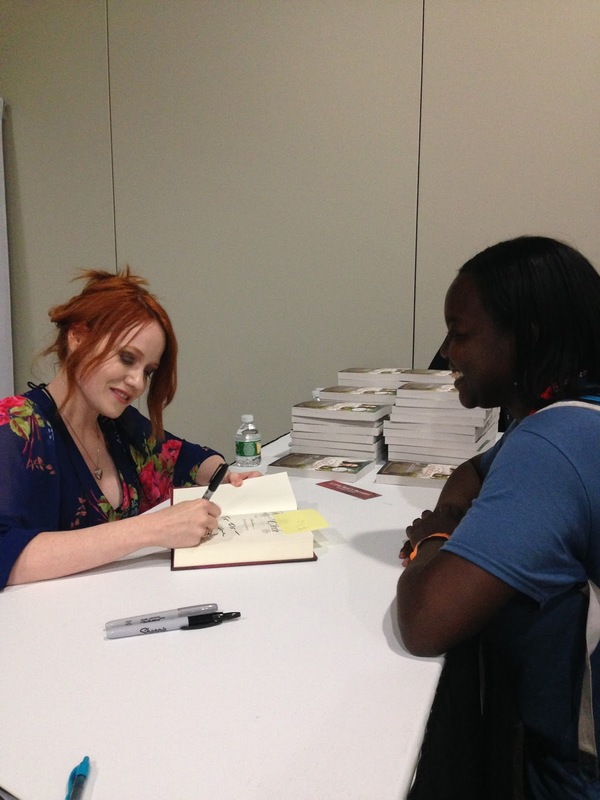 My Goal for Saturday was to meet Richelle Mead and get the ARC (advance reader copy) of her book Soundless that comes out later this year. I made sure to get on that line early to assure this happening, and while I was waiting in that line someone from the neighboring line was offering her wristband for the Paper Towns movie panel that was happening in a few hours. Yeah, as in what was one of the most anticipated panels of BookCon that people arrived crazy early in the morning to assure they had wristbands for. That one! What an amazing random act of kindess!! 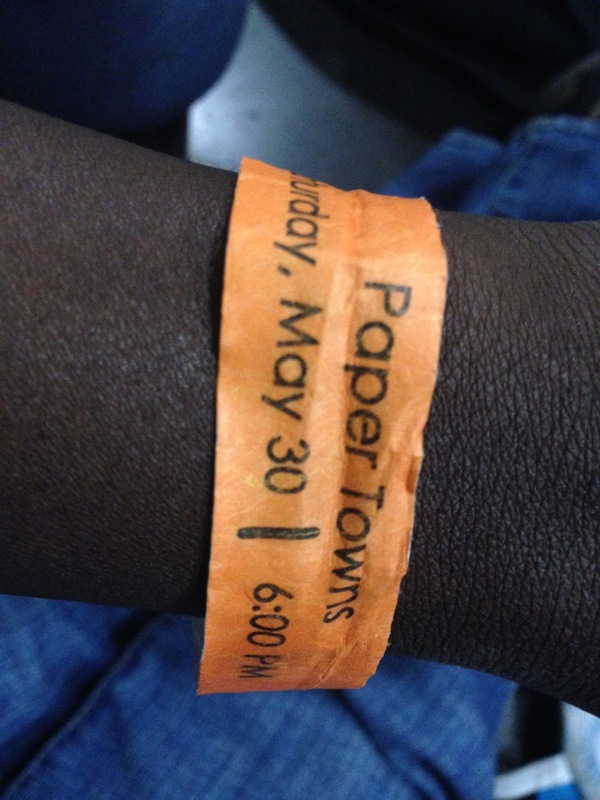 Apparently, she wanted to do something else and no longer needed the wristband, so I was IN!! 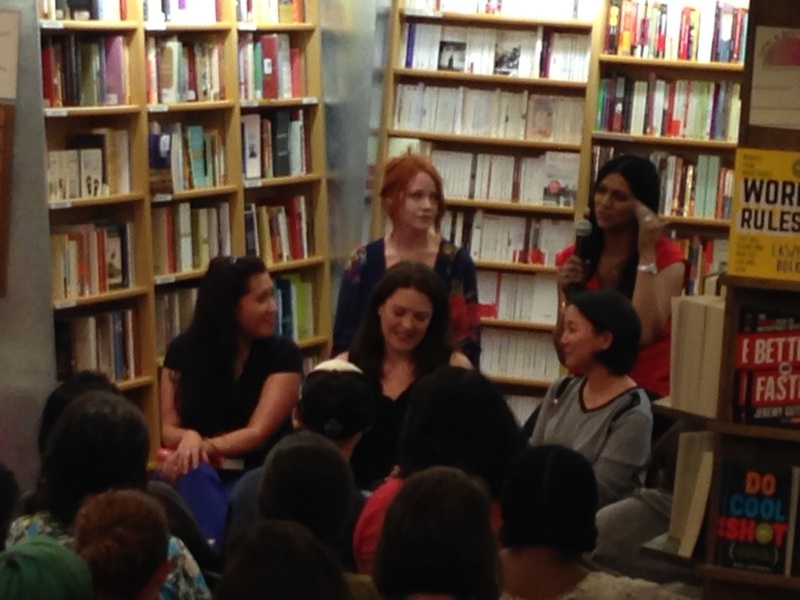 The Paper Towns panel ended at 7 p.m. which is right when the YA All Stars event at McNally Jackson was starting. My friend and I hopped a cab and were able to catch the end of the panel discussion and Q&A section. 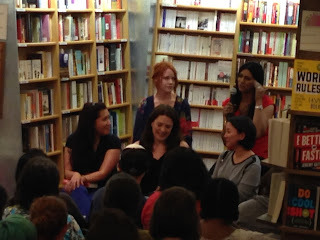 Renee Ahdieh, Carrie Ryan, Marie Lu, Sabaa Tahir, and Richelle Mead. What an amazing line up! The ladies had some great answers for the part of the panel I was able to hear, and then I was excited to get my books signed and pictures taken. They were all incredibly nice! Sabaa Tahir complemented my shirt and Richelle didn't appear too freaked out that I was basically like, "Yeah, I totally saw you an hour ago at BookCon and here I am AGAIN!! I love you!" Sabaa Tahir. I read Ember over this weekend & was about halfway through when I met her. I love the Fire & Thorns trilogy and this was my first time to meet Rae Carson! Also, I got an ARC of her upcoming book Walk on Earth a Stranger. Eeep! Sandy Hall and Temple West. I loved Sandy's book A Little Something Different. Both of these ladies were super sweet! Jodi Picoult and her daughter. I've read several of Jodi's books and liked them. The first book she was wrote with her daughter was cute, so I am looking forward to reading this one. Jennifer Weiner! I completely fangirled! I was seriously rambling about how much I loved her books and she was like, "Tweet me the picture!" So sweet! We decided at the end of the day to do an unplanned David Levithan signing. Because, really, who doesn't love David Levithan?? The only bad thing about BookCon was the leaving! It was raining really, really badly and my books got wet! :( Unfortunately some are ruined, and many are damaged. I am still seeking therapy from fellow book lovers who understand the pain this causes me. Also, I had flight drama, but that's another story for another time. The final haul. I only bought two of these. All the publishers were great, but extra props go to Penguin Random House for rocking the giveaways!! Scholastic and Little Brown were good, too. 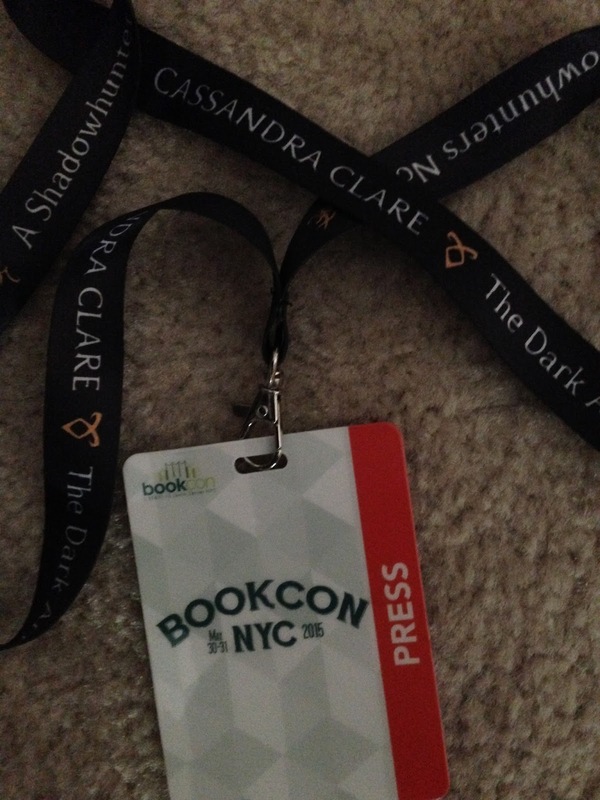 I am sad that BookCon is going back to being only a day long for 2016, but I do hope that I'll be able to make it. It looks like you had an awesome trip. I would love to meet Levithan. I still need to read Cinder. We may have to make that a read along or I may never get to that series.